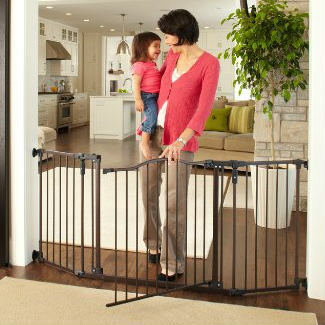 The Summer Infant Expansion Gate is one of the most beloved baby gates and can span up to 72 inches! The Summer Infant baby gate line offers a variety of options to meet just about any household’s needs. 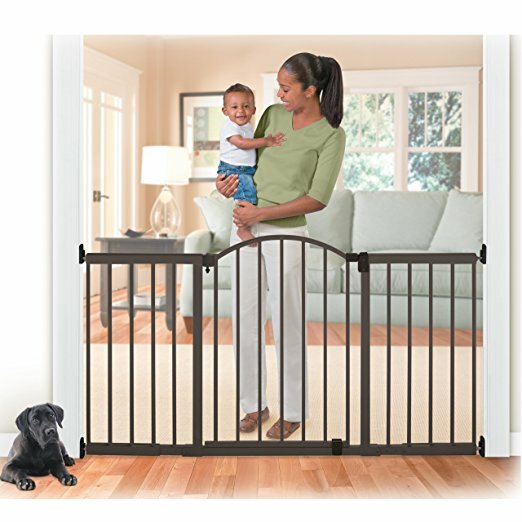 If you’re after an extra wide gate, Summer Infant has options for you that can span up to 72 inches. Need an extra tall gate? A baby gate for stairs? A gate with a door? A retractable baby gate? They have all those, too. 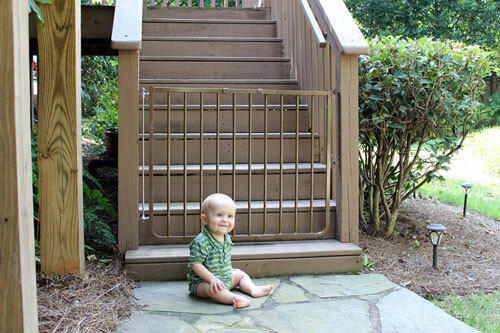 From hardware mounted gates to pressure mounted gates to play areas, Summer Infant produces a wide range of gates for keeping babies safe in every environment. Further, Summer Infant has proven to be a consistent brand. 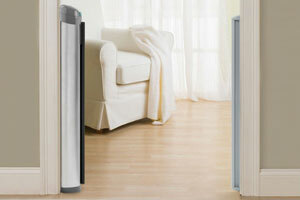 Virtually all of their baby gates have earned high ratings from consumers, a testament to their high standards and the resulting quality of their products. Below you’ll find a comparison table highlighting some of the most popular Summer Infant baby gates to help you get a quick idea of the the different types of gates available. Hopefully the chart above was helpful in getting a sense of the wide range of Summer Infant baby gate models available at different price points. Below we’ll go into more detail on several of the most popular options in different styles. Specifically, we will look at a retractable gate, a hardware mounted gate, and a pressure mounted gate. 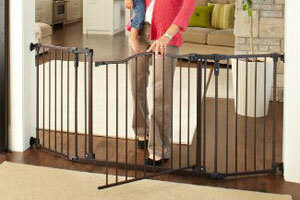 The Summer Infant Metal Expansion Gate is an extra wide model that can span spaces between 44 and 72 inches. The max width is among the largest in terms of baby gates. To adjust the width, there are customizable wings that expand on a slide on the four edges of the gate. 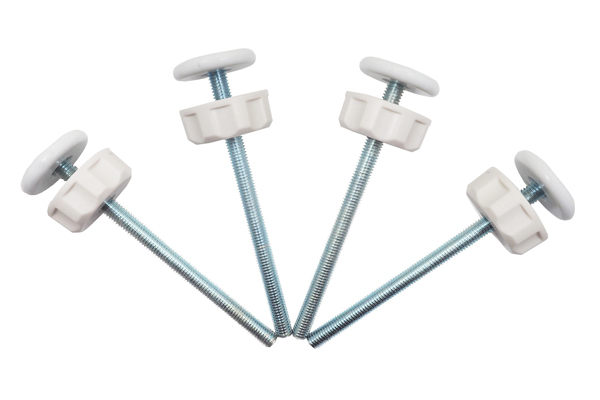 The Summer Infant model looks similar to a pressure mounted system and functions similarly with the expansion; however, this is a hardware mounted gate that needs to be secured with screws once the gate width is set. Steel construction makes this gate even more sturdy. This gate includes a door in the central panel for convenient pass-through. Adding to the doors convenience is that it can swing both ways as you need it. 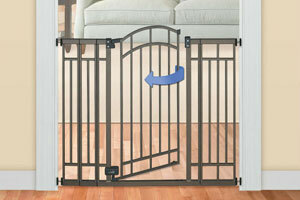 By comparison many baby gate doors are one-directional and don’t offer the option to go either way. While the door on this gate is designed to be openable with one hand, some customers have lamented that it is in reality difficult to open with one hand due to the disengage feature on the lock. This aspect of the gate seems to be the most commonly mentioned drawback. 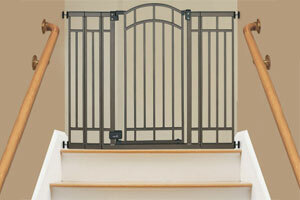 This gate comes in both the white pictures and in a bronze finish, although the bronze is slightly more expensive. 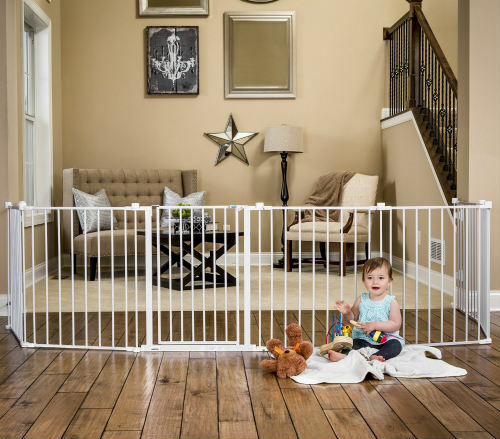 If the one-handed operation isn’t a huge deal for you, and you need an extra wide baby gate, the Summer Infant Expansion Gate can be a good option for your home. The Summer Infant Retractable Gate is one for the best value retractable baby gates. It is priced at nearly half the price of other brands’ similar retractable baby gates, yet still maintains good quality. 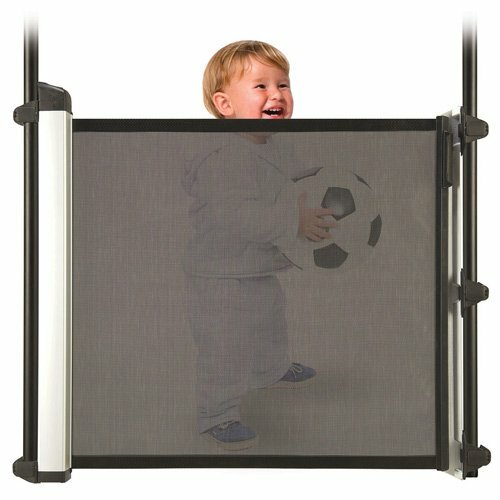 Unlike many baby gates, this one uses a soft mesh as a barrier. The black mesh of this Summer Infant gate features an elegant and subtle decorative pattern. It is also mainly transparent so you can keep an eye on little one through the gate. Some parents worried that the mesh would not hold up to daily use, but it seems that the mesh durability is surprisingly good based on user reviews. This gate needs to be hardware mounted through attaching its housing unit to the wall with screws. The top of the gate housing unit has a simple locking mechanism that simply needs to be pushed down to lock and pulled up to unlock. Another highlight of this Summer Infant baby gate is that it has been JMPA certified for use at both the top and bottom of stairs. To turn to the size of the gate, it is 30 inches tall and can span spaces up to 50 inches wide. 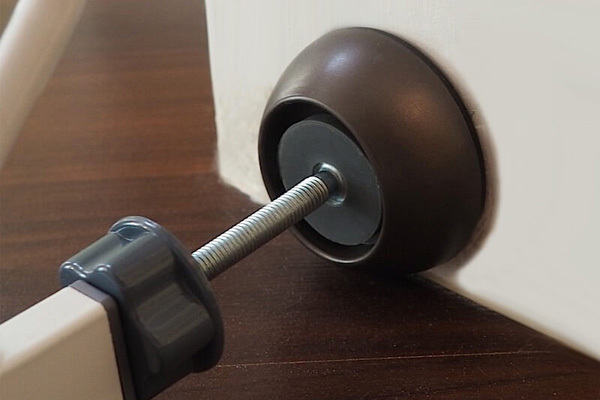 As a bonus this set comes with some handy extra pieces that most other sets require you to pay extra for, such as a baseboard kit that spaces out the top of the enclosure for a perfect installation on walls that have baseboards. 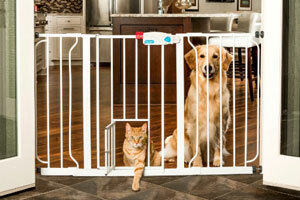 The Summer Infant Multi-Use Deco Walk-Thru Gate is a versatile option. It is a pressure mounted gate that can span spaces from 28 to 48 inches wide. This model is also rather tall at 36 inches in height. 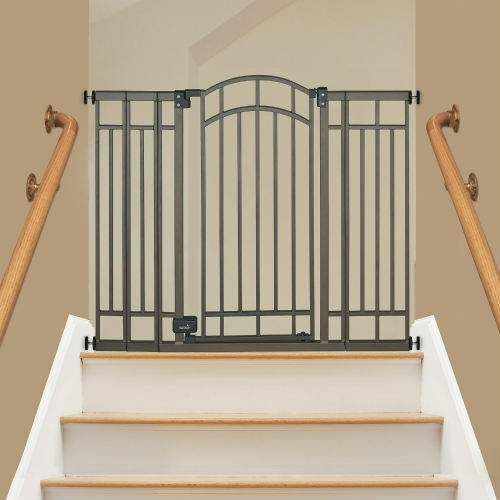 This gate also comes with optional hardware, in case you need to use it to for a space where the extra security of a hardware mount is necessary, such as at the top of stairs. Similar to the hardware mounted extra wide model above, this gate has a door in its central panel so parents can easily pass through. 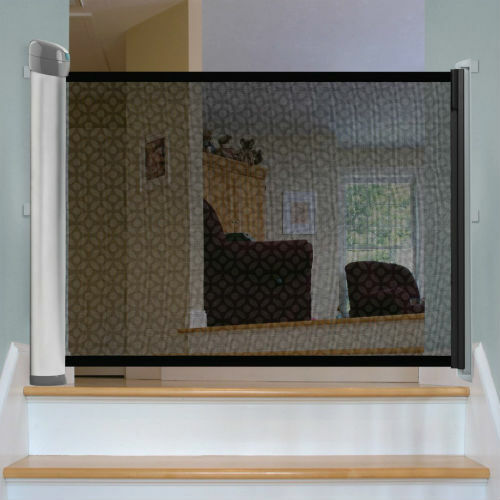 The door offers one-handed operation and features an auto-locking mechanism. The door can swing in either direction, but this gate includes a door stopper in case it is used on stairs and should only swing away from them. 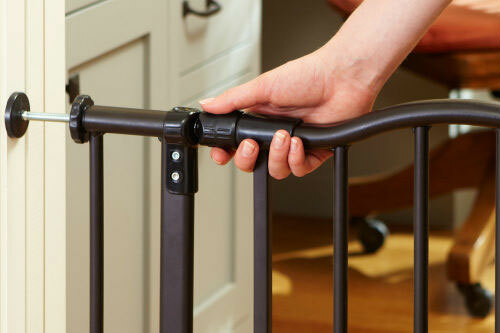 This Summer Infant baby gate is also a fairly stylish option to boot. An elegant arched doorway and a high-end matte bronze finish certainly make for a pretty accessory. With its ability to be either pressure mounted and hardware mounted, the Summer Infant Multi-Use is great for evolving families whose needs may change over time.